Robb Report is a English language magazine spotlighting the luxurious commodities such as real estate, wines, watches, fountain pens, cigar humidors, gadgets and so on, since our privileged society’s hunger for deluxe products cannot touch the summit till our planet exists. It is ironical, but the needs of man of today’s world have got no ends. 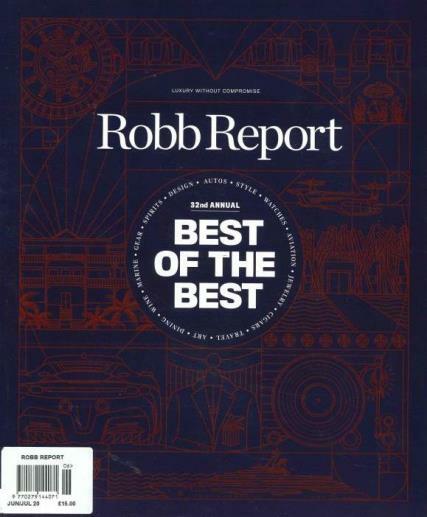 Robb Report seems to be written by people with a genuine understanding, knowledge and interest in their subjects of coverage which is laudable.he lavish descriptions give the readers a new lease of life to struggle procuring the opulent lifestyle. Its world class photography of dear merchandise can effectively tempt a noble to purchase it and relish the moments. It is not only published to please the rich but also inspires a common - man to aspire for this cream and buckle down to make fortune whole - heartedly. It brings out the swanky vacation spots to you which might have been your unexplored quest. The glossy glimpse of the varied products and eloquent illustration displace the readers in the lap of luxury. This periodical is the perfect match for the dreamers and optimists filling their life with more challenges and ambitions. The chapters of this magazine are directly proportional to the splendid demands of the privileged making its chapters infrequent and interesting. The coverage areas under this report are to the point in it without any sign of unnecessary stretch which is denotative of high quality.